Apparently, I have a girlie phone. CNET reports that a recent study shows that women prefer iPhones, while men prefer Android phones. That's really not a surprise. Because studies have been showing that for a while, just nobody ever made a big deal about it. For example, Business Insider reported in 2010 that iPhone was the choice of women, while Android phones were the choice of men in a study by Nielsen. There's also a survey from 2011 that indicates women prefer iPhones, while men prefer Android. So, this latest report shouldn't surprise anyone. 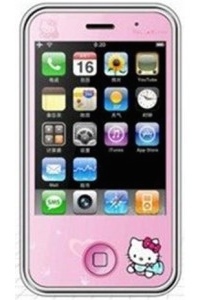 My phone is an iPhone, which makes it a girlie phone. And I'm okay with that. You see, there's nothing wrong with girlie things. No, I'm not trying to act like some metrosexual -- which is, I think, someone who's sexually attracted to the public transportation system. No, I'm simply okay with stuff being girlie. Like Secret deodorant. I use Secret. Well, not all the time. But, if it's on sale, yeah, I'll pick it up. Started doing that in the Army. You see, on a field exercise, a lot of soldiers will forget stuff, or run out of stuff, and want to borrow yours. So, after my first field exercise, next time I went to the field, I took my wife's Secret deodorant. They stopped asking to borrow it. And, Secret works. So, if that's what's on sale, I'm picking up some Powder Fresh Scent solid. Or Lady Bic shavers. They used to come in pink. And, they used to be the only disposable razors that had that strip that made shaving more comfortable. When you're in the field, and it's cold and you're standing next to a HMMWV looking into the mirror trying to get yesterday's facial growth off, that little strip helps. Plus, others quit asking to borrow a razor blade from me, because mine were pink. The Lady Bic razors come in other colors now, but they still make some pretty pink ones. So, no, I'm not afraid of using a girlie phone. My iPhone does just fine. And, if you have an Android phone, it probably works just fine for you, too. But, I like my iPhone, and my next phone will likely be another iPhone. So what if it's a girlie phone. Think about it, fellas. Don't you like girlie things? Really, admit it. You like girlie things. Like girlie parts. You know, the parts the girls got that the guys don't got. You like the girlie parts. And so do I. And if that includes an iPhone, I'm okay with that. And, if it helps with getting access to other girlies things, I'm more than okay with it. Just keep telling yourself that. Whatever helps you sleep at night girly-man. I've also noticed that cookies taste better when girls bake them. The girl version of elfin magic, I suppose. Heh; I was talking with dance moms yesterday (wife having taken other daughter to doctor) and packing lists came up after they had mentioned dance bags, are they complete, etc. I mentioned that my sergeant trusted me to pack my stuff properly. Once I had gone to Fort Benning on an field exercise and thought I hadn't packed any underwear (except in my ruck). I stopped at the clothing supply store and bought 7 pair. Then I later found out that I had brought underwear, it was just in the very bottom of my duffel. Reminds me, where can I get those L-shaped flashlights? Mine has gotten corroded and unreliable. When shopping for clothes, other than work clothes, bringing a female along is a great idea. also when shopping for drapes, furniture or china. not for her opinions, just to get a little service. "..., if it helps with getting access to other girlies things, I’m more than okay with it." it might help to stop stealing her Secret, too. Back in the 70s, I worked in an auto salvage yard. Customers were notorious for borrowing tools and then 'losing' them for you. Snap-On came out with a ratcheting screwdriver with fuschia handle. I still have that screwdriver and all it's assortment of bits. Huh. I like droids. I guess I didn't take the time to read the studies. I used to have a pink case (until I got my Galaxy S4 Mini). Does that count? @2 Cookies taste better when *I* make them, you mean. :P Feminine magic varies from woman to woman, it's not a constant. @8 - Yes, and (speaking from experience) I agree feminine magic is variable. On the other hand, I've never met an old woman with gray hair whose cookies weren't pure magic. @9 Any of you guys know an old woman with gray hair who is single? @10: Harvey's a young punk rocker. He needs someone without gray hair. Now, me, on the other hand... I don't care if the hair is gray but she has to have hormones left in the bottle. @12 and @13: I don't know anybody who's gray haired and single. Alas. My dad's hair went from blonde as a child to dark in his teens through thirties. Then he went gray, then silver, and now he has a full head of white hair. I was blonde as a child, and now my hair is chestnut. I wonder if my hair go through the same changes his did? And no. I don't color my hair. I think we have strayed off the topic of Basil and his gender identity issues which is problably leading to more confusion with the 50 shades of gender that Facebook has now ( I wonder which one Basil picked). I have also noticed that Anyonmiss is often the cause of topics straying. That is what happens when you let a real girl have access to the internet. Guys just forget about the serious business of mockery and get all flustered at the thought of phermones and cookies. "metrosexual — which is, I think, someone who’s sexually attracted to the public transportation system." I think someone just called me a trouble-making female. Hey, I'm not complaining of the turn it took. And, if Harvey gets some Giggity in the process, so much the better for Harvey and the Silver Cougar. That is what I like about the IMAO staff. Always willing to take one for the team. It's the chestnut hair, Miss Anony. Not your fault for having some Celtic blood in your ancestry. Yep. No Irish that I can find, but lots of Welsh. I did a review awhile back of the Venus razor. It actually gave me a really nice shave, minus the slimy lotion I had to wipe off when I was finished. I did feel compelled to knock back a shot of JD when I was done though, to reassert my manliness. Dude! Yes, it's *strong* enough for a man - but it's made for a woman! Not cool! @22: The Welsh are Celts. But slso some Welsh, Scottish and English blOOd. I also have six fingers and toes. And an eye in the back of my head. Plus, psychic powers. I'm also Swiss, English and Danish. But only 5 fingers on each hand. Actually, four of them got chopped off in a terrible potato harvesting accident. I thought I was the only one to do the Secret in the field trick. Works too. I figured since I was carrying an M60 no one would seriously try to tell me it was girly. And I smelled nice too... I also quit smoking menthols and went to any unfiltered brand, that saved me a lot of money as well. I like water with lemon. Would you like one? Sure. Got gin? If [no gin] then [vodka]. I like water with barley and hops.